Bhogi is celebrated on Tuesday 13th January 2015. Bhogi is the first day of the four days celebration of Makar Sankranti. Bhogi festival celebrated in the Pushya month. Sankranti is the one festival celebrated on the basis of movement of the sun. 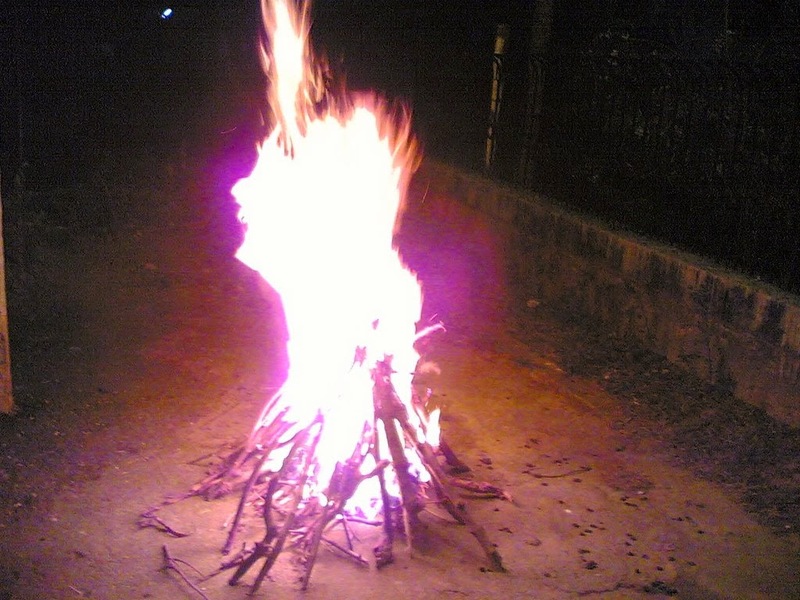 Bhogi begins with bonfire(Bhogi Mantalu). On Bhogi day people will gather together with un useful sticks, old furniture, wooden items and other solid fuels then lit fire in the early hours of the day famously known as Bhogi Mantalu. people will dance around Bhogi Mantalu. the The items used to fire Bhogi Mantalu are no longer in use. Bhogi Mantalu resembles the sign of lord Sun. Bhogi is day popularly meant for cleaning. During the olden days only agricultural waste used to burned on the day. On the early morning big Rangoli's are drawn in front of houses to welcome goddess Lakshmi. On the occasion of Bhogi, various Rangoli competitions are organized. Gobbemalu made of cow dung in triangle shape and on the tip placed the grass this will be placed in the middle of the Rangoli and worshiped. To pour Bhogi Pallu is calculation as the Seven of the sun's chariot horses and Seven colors of the sun's light. In the evening of Bhogi it is a ritual to combine bear fruits, regi Pallu, pieces of sugarcane, Jeedi Pallu, coins and flowers petals pour on children up to Seven years of age this procedure is known as Bhogi Pallu. Bhogi Pallu will pour to protect children from evil eye, bless the children for long life and should get the energy of Lord Sun, Lord Moon and Goddess Earth. Generally son in laws and neighbors are invited and they will take the hand full of fruits and pour slowly on the child. One person should pour thrice (three) times. On Bhogi day flying of kites will be started. Bhogi festival is dedicated to Lord Indra, the Vedic God of thunder and rain, festival observed during the ancient Chola period. Bhogi Mantalu means if we worship Lord Sun it indicates we worshiped all the Gods. As Lord Sun will gives wealth to us. According to purana's dwapararayug king named satrajit to take advantage of the infinite gold with samantakamani as he prayed Lord Sun. purana's also says that women's worship lord Sun on this day will be blessed with wealth. The Bhogi is celebrated highly in Andra Pradesh. Basically it is the the time of harvest season and it is the time of joy. 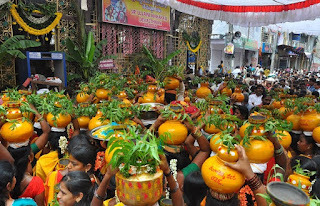 Compared to Telangana people Andra people celebrates grandly the Sankranti festival. On the special occasion of Sankrathi there some sweets will be prepared, espacially ariselu and sakinalu. ariselu made with Rice powder, gingelly (Nuvullu), Jaggery (bellam) and ghee. Sakinalu made with Rice powder, gingelly (Nuvullu) and Jeera.